Individuals born in the latter years of the baby boom held an average of 11 jobs from age 18 to age 44, with the majority of the jobs being held before age 27. These baby boomers (who were born in the years 1957 to 1964) held an average of 4.4 jobs while they were between the ages of 18 and 22. The average number of jobs fell to 3.2 while these persons were ages 23 to 27 and to 2.6 while they were ages 28 to 32. These individuals held an average of 2.4 jobs while they were ages 33 to 38 and 2.0 jobs while they were ages 39 to 44. On average, men held 11.4 jobs and women held 10.7 jobs from age 18 to age 44. Men held 4.5 jobs from age 18 to age 22, compared with 2.0 jobs from age 39 to age 44. The reduction in the average number of jobs held in successive age groups was similar for women. From age 18 to age 44, whites held more jobs than blacks or Hispanics or Latinos, although the difference is concentrated among 18- to 22-year-olds. On average, whites held 4.6 jobs between the ages of 18 and 22, while blacks held 3.5 jobs and Hispanics or Latinos held 4.0 jobs. From age 23 to age 44, there was no significant difference in the average number of jobs held by whites and the average number of jobs held by blacks or Hispanics or Latinos. These data are from the BLS National Longitudinal Surveys. To learn more, see "Number of Jobs Held, Labor Market Activity, and Earnings Growth among the Youngest Baby Boomers: Results from a Longitudinal Survey" (HTML) (PDF), news release USDL-10-1243. 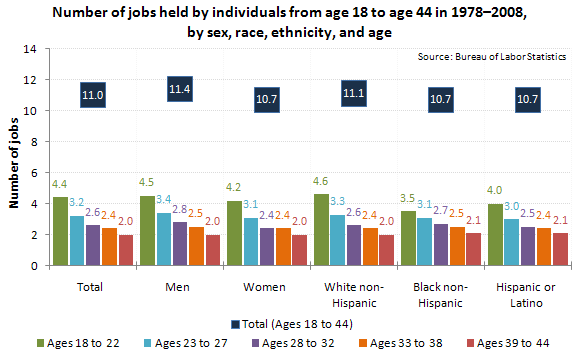 Note that jobs that were held in more than one of the age categories were counted in each appropriate category, but only once in the total. Bureau of Labor Statistics, U.S. Department of Labor, The Economics Daily, Number of jobs held by baby boomers, 1978–2008 on the Internet at https://www.bls.gov/opub/ted/2010/ted_20100924.htm (visited April 25, 2019).